In the Greater Philadelphia Area, we’re coming out of a long, particularly tough winter. As the weather begins to transition to a kinder, gentler season, it’s the perfect time to have make sure your HVAC system is running at peak performance. We caught up with Douglas Cordero, vice president of C&C Heating and Air Conditioning, a Souderton-based company that creates custom-designed heating, cooling and home-comfort systems for homeowners throughout Bucks and Montgomery counties. Cordero offered his perspective on seasonal HVAC maintenance, how to make sure your current system is running as efficiently as possible, and the advantages of C&C’s service agreement plan for preferred customers. We’re coming out of an extended winter and heading into spring and summer. What should homeowners keep in mind right now as it relates to their existing HVAC system? The most important thing a homeowner should be doing this time of year would be replacing their filter, because it’s best to start every new season with a new filter. Filters should be changed every three months or sooner, depending on what type of filters are being used. Also, now would be the best time to have your system professionally serviced. How often should homeowners have their HVAC systems serviced, and what time of year? It is best to have your system serviced twice a year. We start our air conditioning maintenance at the beginning of April and our heating maintenance start in September. What’s at risk if homeowners don’t service their HVAC systems regularly? By not having your system serviced, you risk having unavoidable breakdowns of your system—and believe me: They never break down on the nice days. Also, without having it serviced, your system may not be operating at its peak performance, which could cost you more money to operate or cause costly breakdowns. Upon servicing, will the homeowner’s system function more efficiently and effectively? During a service call, we will be able to check and clean your system to make sure it is operating as efficiently as it should and offer advice as to any changes that can be made to help you save money and be more comfortable on the days you need it most. I’ve heard a good deal about your service agreement plan for preferred customers. What can you tell me about it? 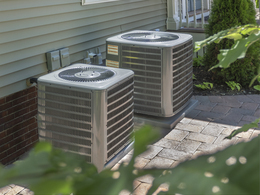 Our service agreement that we offer includes two seasonal inspections to ensure that your system is operating at its best. It also puts you ahead of the customers who choose not to have regular maintenance done on their system and instead wait until it’s the hottest and coldest days of the year and find themselves in need of service. We can’t always get to every customer that calls in for a service call on those worst days. As a preferred customer, however, you are always the most important to us, and you will be scheduled and taken care of as quickly as we can. The best benefit that I see with our service agreement is that it gives you a reduced pricing rate on labor and repairs, 365 days a year. That means no overtime rates on nights, weekends and holidays. Our technicians on call throughout the year have seen firsthand the savings our maintenance customer can receive when a repair may need to be made at those not-so-convenient times. For more information from C&C Heating and Air Conditioning, call (215) 799-0515 or (800) 564-3382, or visit CC-HVAC.com.